Scott Woody demonstrates The Mating Game, an active learning activity that teaches Mendelian genetic mechanisms. 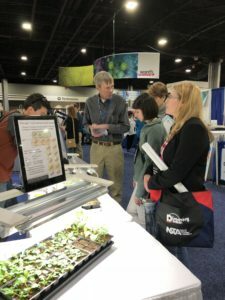 The ASPB Education Committee hosted an Education & Outreach booth at the National Science Teachers Association (NSTA) Conference in Atlanta, Georgia during March 15th– March 17th, 2018. Located at the Georgia World Congress Center, the booth was organized by ASPB Education Committee member Scott Woody and ASPB Education Coordinator Winnie Nham. Local volunteers helping to host the booth were Dr. Mautusi Mitra and her students (University of West Georgia and Georgia State University [Perimeter College]), and Dr. Zhonglin Mou (University of Florida). Scott Woody and local ASPB member-volunteers and undergraduate students with a passion for plant biology successfully shared their enthusiasm about plants and green micro-algae with the booth visitors and made the event a huge success. The ASPB booth attracted hundreds of Biology school teachers and university instructors from across the nation. Many of these Biology teachers expressed their strong interests in using ASPB resources in teaching plant biology and have reached out to the ASPB booth volunteers after the NSTA meeting to learn more about using plants/algae in K-12 through K-16 Biology education, reflecting once again the importance of these ASPB outreach activities. Another major attraction this year in the NSTA-ASPB booth was the “Chlamydomonas reinhardtii (“green yeast”) – a powerful Biology teaching tool” station, hosted by Dr. Mautusi Mitra (University of West Georgia [UWG]) and her undergraduate research students, Kevin Nguyen and Ja’von Swint, and her former graduate student, Phillip Grovenstein (currently an instructor at Georgia State University, Perimeter College). At UWG, Mautusi integrates her molecular photosynthesis research in Chlamydomonas in teaching a Cell and Molecular Biology course. The station included live cultures of wild type, high light-sensitive and chlorophyll-deficient Chlamydomonas strains. She shared with the science teachers how the green micro-alga Chlamydomonas can be used for designing hands-on activities for General Biology, Plant Biology, Biochemistry, Plant Physiology, Neuroscience, Optogenetics, Genetics, and Renewable Energy generation courses. 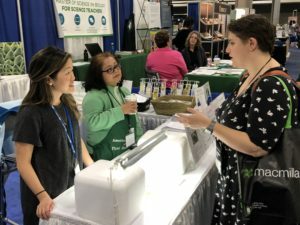 She distributed handouts about Chlamydomonas media recipes, Chlamydomonas-based hands-on lab activities and how these hands-on activities topics align with the NGSS core concepts and the 12 Principles of Plant Biology. More information about Chlamydomonas research and education can be found on Chlamydomonas Resource Center website (https://www.chlamycollection.org/) and on Mautusi’s website (https://www.westga.edu/mitralab/). An additional “impromptu” attraction at the ASPB booth was the Scenedesmus (green algae) bracelet contributed by Ward’s Science. The bracelet contained balls of algae in growth media containing a bicarbonate pH indicator that changed color as algae balls were shifted from dark to light, a powerful demonstration of the switch from respiration to photosynthesis. Booth visitors took home over 200 copies of the highly popular My Life as a Plant Coloring Book and the 12 Principles of Plant Biology bookmarks and labs. Other resources available at the ASPB booth included information on the various programs and resources available through ASPB including PlantingScience, the ASPB Master Educator Program, Promoting Active Learning & Mentoring (PALM) Grant, and the Plant Biology Learning Objectives and Outreach Materials (BLOOME) Grant. We would like to thank all our volunteers who are mentioned above for helping to make our booth a grand success. Special thanks go to the ASPB “booth guru” Scott, Winnie for all the hard work involved in coordinating the booth setup and volunteer lineup, and the UWG students for making Chlamydomonas a “rock star” at the ASPB booth.